Beautiful, newly decorated, spacious room, with rooftop terrace with hot tub and gorgeous views of western part of the island. The location was ideal, in a small village away from the crowds of Oia and Thira, yet with 4 or 5 restaurants in the center of the village within walking distance. Linda was an excellent hostess, spending much time recommending points of interest , restaurants, driving directions, and provided a delicious, varied breakfast each morning. Really a wonderful, peaceful stay! Linda is a great host, takes good care of the guests and the room. She makes a big breakfast, served in your room. Brand new b&b and very comfortable. Liked the decoration and the rooftop terrace with jacuzzi and sunbeds. Akrotiri is a small, quiet village, easy to reach by rental car. The bed was soo comfy , the hot tub on the roof with a great view, the breakfast was delicious, looked amazing and there was so much food. We liked everything. Linda welcomed us very friendly and showed us on the map some places to visit in Santorini, with good advices also on food! Misteli is located in a quiet area, the parking is close, there is a supermarket if in need of something and many mini-restaurant around. Linda served us the breakfast (a very hearty one) outside the room at the time we asked. The place is clean, the room also and the terrace is beautiful. Highly recommended! We had a very pleasant stay. The hotel is new and well designed. The rooms are very clean, comfortable and the position is close to Akrotiri's centre. Linda was truly a lovely travel guide for us, who gave us a lot of information and advices about the island. The breakfast is "taylor made" and delivered directly to the room. We enjoyed our trip also thanks to Linda. Clean and comfortable room, very good location, rooftop with jacuzzi and beautiful view, amazing breakfast, good tips from Linda (manager). Linda is very helpful and the hostel is beautiful! Great vacation! We went for honeymoon and it was perfect! Room is clean, the terrace upstairs with hot tube is amazing. The hotel is perfectly located in the small town of Akrotiri, and Linda gave us all the information we needed with always a special attention. Highly recommended. We stayed here for 9 days and we spent a fanstastic holiday. Misteli is situated in the center of the city of Akrotiri, near to little supermarkets and restaurants. The rooms are always clean and have an amazing design. We also liked very much the staff, in particular Linda, who was very kind and helpful... She made us feel so welcome. We’ll be back! Everything about this accomodation was even better than our expectations. The room was absolutely new, very nice and cosy furnished with super comfy bed. Breakfast was good, fresh and served on the terace right infront of the room. All we had to do was manage the time with Linda, our house keeper. Speaking about Linda, she was absolutely friendly, helpful, gave us a lot of good advices about the island. I have to mention she was so kind to sew up a button on my dress. We had also enjoyed the roof top terace with jaccuzi, the view was spectacular ! So, if you are looking for a private stylish and cosy accomodation for affortable price Misteli is the right place. It made our vacation even more unforgetabble. Lock in a great price for Misteli – rated 9.7 by recent guests! Located in Akrotiri, 1,950 feet from White Beach, Misteli offers air-conditioned rooms and a terrace. Boasting luggage storage space, this property also provides guests with a restaurant. Archaeological Site of Akrotiri is a 9-minute walk from the property. Guest rooms in the bed and breakfast are fitted with a kettle. Featuring a private bathroom with a bath or shower, rooms at Misteli also boast free WiFi, while some rooms also offer a terrace. All guest rooms feature a wardrobe. Guests at the accommodations can enjoy a continental breakfast. A hot tub surrounded by sun loungers and umbrellas is available on the roof terrace with views over the village and the Aegean Sea. Red Beach is 0.6 mi from Misteli. Santorini (Thira) Airport is 5 mi from the property. When would you like to stay at Misteli? This quadruple room has a balcony, stovetop and soundproofing. This double room features air conditioning, private entrance and electric kettle. House Rules Misteli takes special requests – add in the next step! Misteli accepts these cards and reserves the right to temporarily hold an amount prior to arrival. Please inform Misteli of your expected arrival time in advance. You can use the Special Requests box when booking, or contact the property directly using the contact details in your confirmation. The restaurant was closed for the season. That We only stayed one night. nothing. everything was perfect, just if I have to say something maybe consider to add some shelves in the wardrobe. but that's it! Linda was the sweetest. She was so warm and welcoming and really turned our trip into a wonderful experience. Her hotel is really beautiful. The room was very comfortable and clean - I loved the outstanding design choices. Also, the Jacuzzi on the roof top was stunning. The breakfast was delicious and lovely made. She even organized a car to rent for us to explore the area. I guess it’s obvious that Linda runs this pretty little hotel with lots of love. I can definitely recommend it. 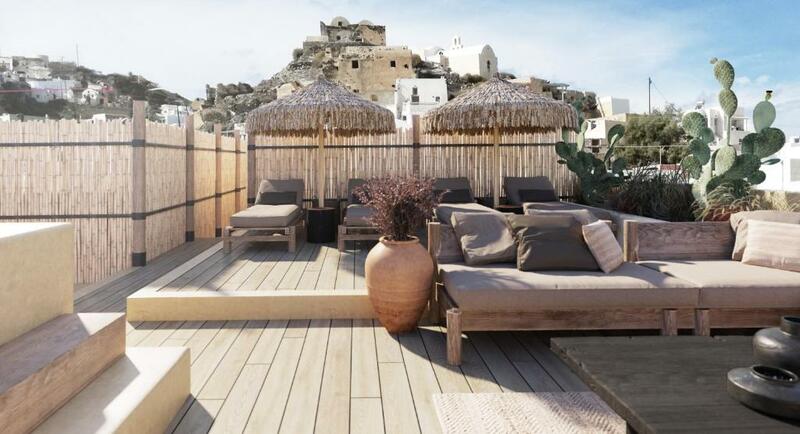 Misteli is a brand new studio hotel in the city center of Akrotiri, less crowded than Fira and Oia and nearer to the main beaches of Perissa, Perivolos and Vlychada. As we were the first guests, small things still needed to be fixed, but Dionisia and all the staff were very welcoming and we never felt to miss anything. The building is really well designed and modern. Breakfast served in the room was very good.